I’ve been a Herman Story wine club member since 2008, making Herman Story my oldest and most enduring wine club. I’ve jumped onto and off of a lot of wine club bandwagons over the years. But I’ve stayed with Herman Story — because I haven’t stopped looking forward to my wine shipments. That’s my barometer — if I stop looking forward to my shipments, then it’s time to break-up. Earlier this summer, my family gathered in the Finger Lakes region of New York for our triennial Family Wine Trip. Yep, that’s a thing in my family. We’ve been doing these trips/reunions for 12 years now. It was at our second reunion, in Paso Robles, when we got to know and love Herman Story even better (any winemaker that not only invites your crazy family to have a picnic in the middle of their barrel room, but sits down with you, and pops open half a dozen bottles of wine, is tops in my book). Over time, I’ve accumulated several vintages of several different Herman Story wines. 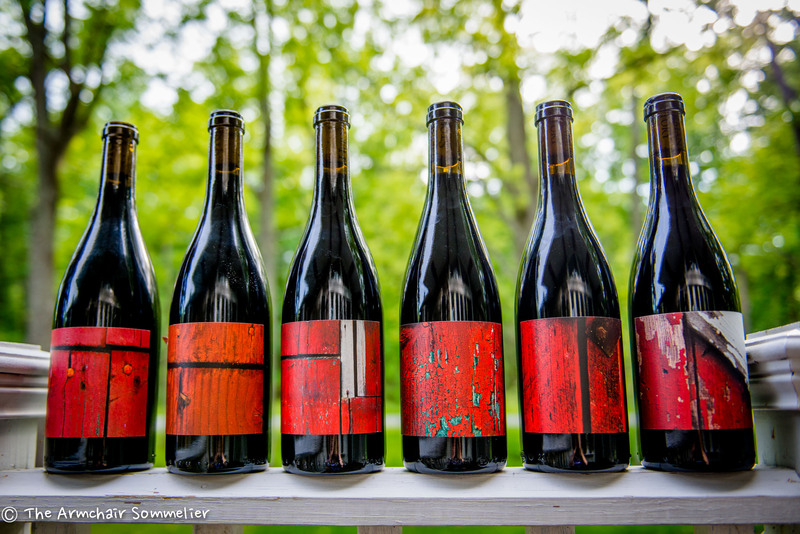 And, since we were driving (vice flying) to the Finger Lakes (and had the luxury of being able to stuff as much wine in the car as it could hold), I thought it might be fun to do a vertical tasting of Herman Story Nuts & Bolts Syrah. Why the Nuts & Bolts? Why not? Also, the Nuts & Bolts labels are really, really cool. Meet the lovelies: 2008 through 2013. They cut a handsome figure, don’t they? Herman Story (Russell’s Grandfather) moved around a lot but always had a red barn on his property. So every year we grab a camera and drive around and look for red barns here in San Luis Obispo county to photograph for the new label. Nuts and Bolts is our highest production wines and always one of the best, but it’s also the nuts and bolts of our business and a mosaic of about 9 different vineyards. OK, I really, really love that. Grandpas and red barns . . . gets me right in the feels. These labels are even more awesome when they’re grouped together. Can’t you just see these printed on canvas and hanging above the fireplace? There were ten of us tasting that night, and as everyone voiced their comments and observations, I tried to scribble them down, but my pen could barely keep up! When I went back to read them, I noticed two things. One, my handwriting used to be much better (I used to have second-grade teacher handwriting). And two, my tasting notes looked like word salad — so many of the descriptors kept repeating. So, instead of trying to untangle my tasting notes, I decided it might be fun to organize them graphically. 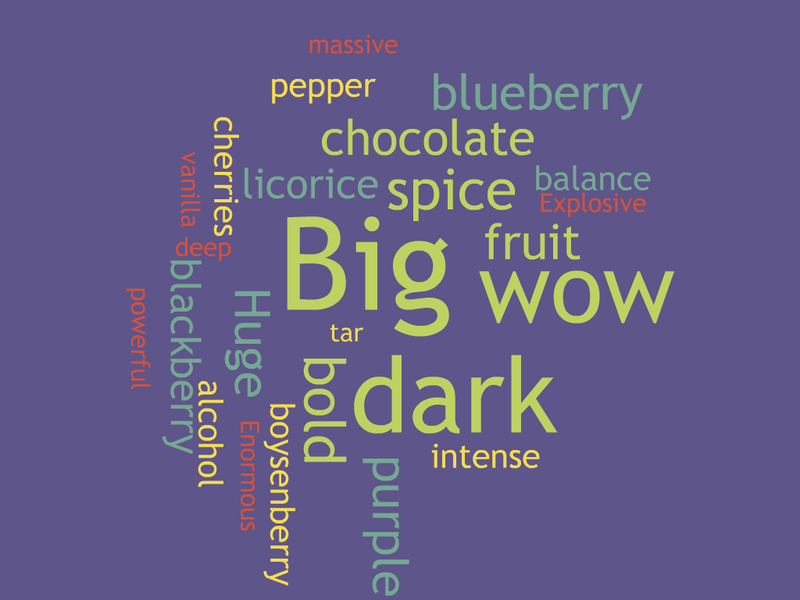 I threw my tasting scribbles into a word cloud generator. For all you visual learners out there, this exactly sums up the style of Nuts & Bolts Syrah. I couldn’t write a wine review that illustrates it any better. But, I know what you’re thinking. A vertical tasting is about vintages, not styles. How does the same wine evolve over time? This just got interesting. No votes for the young’uns? This doesn’t mean the younger vintages aren’t good — they are. And taken singly, you might not notice. But when compared alongside the older vintages, the younger vintages are all muscle car — handsome and powerful, but a little unbridled. The older vintages are James Bond Aston Martin — still handsome and powerful, but with a sleek edge of elegance. The bottom-line and big, bold takeaway for me is this: The older, the better (kind of like George Clooney or a pair of cowboy boots). As the wines get along in years, something magical happens inside those bottles. The downside? Older wines require patience, Grasshopper. If you can’t wait, you won’t be disappointed with the younger wines. But good things come to those who wait*. *Or decant. Always do your Herman Story wines a solid and decant them. Heck, double-decant, even. You will be rewarded! Great article! I am also a Herman Story wine club member starting with the same exact vintage as you…2008! I have thought about doing a vertical tasting party many times…Nuts & Bolts…White Hawk…never could decide really. If I were to decide to do the same vertical I would be missing the 09’s…now I know why…according to your results they were the best! Must be why I drank them all. Truth be told, I favor the cool vintage ’11’s. A lot like you I have had a lot of wine clubs come and go over the last few year but have always stuck with Russell…for good reason. I just saved your website under my favorites. Hi Mark! Thanks for stopping by and taking time to read my post. The 09’s are a killer vintage, I can see why you couldn’t wait to pull the corks on those guys! If you set up a vertical tasting, please let me know how it goes — I’d love to hear your results, too! Thanks for favoriting my blog, too! Salud!! HUGE fans of Herman Story. Russell and the crew definitely know how to have fun while they work. It is always an adventure when you taste there. You never know what you will see, but you are guaranteed to be told an awesome story of how they partied the night before. Great people and great wines! OMG . . . sooooooo much fun!! Such QUALITY folks at Herman Story! Wish we got out to CA more often so we could visit more often! We will likely be out in SoCal (Pendleton) next summer, if we can swing a side trip up north, would love to stop and visit you guys, too! Salud, Lori!! I have been interested in Herman Story wines since reading your compelling article (I believe you published this when you and I were both enrolled in Miss Jane’s CSW exam prep class). I am looking forward to finally visiting the winery next Thursday! I know you will have a BLAST!! Let me know what you think . . . Cheers!